I have had been pulled in 1,007 different directions lately and I am just all out TIRED. My kids have had it too. I know my posting has been slim lately and I have not read other blogs in a few weeks. I guess you can say I am boycotting it all. But do you blame me? Sunday night was family game night and last night was movie night. Or looking at this photo, one might say it was “everybody pile up on mom” night. Whatever it was, I was one content momma. 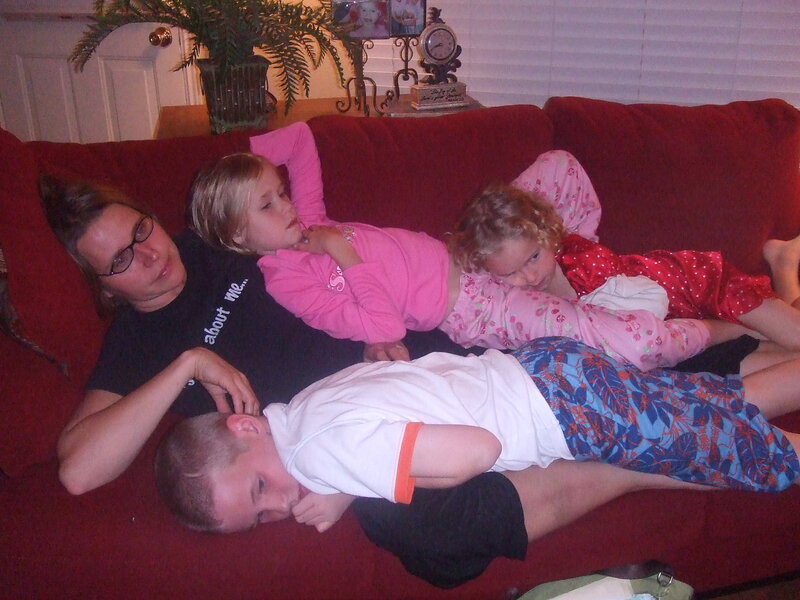 I was so relaxed that I actually dozed with all those kids on top of me. We sent them to bed at 8:10 and I crawled into bed myself. I slept from 8:25pm to 5:45am. This entry was written by texasknights and posted on November 4, 2008 at 2:59 pm and filed under Family Times, Random. Bookmark the permalink. Follow any comments here with the RSS feed for this post. Post a comment or leave a trackback: Trackback URL. glad to know things are more peaceful in your home! I love that…such a sweet picture!